It’s been a bit over a month since we succesfully introduced Joya Red at the IPCPR tradeshow in Las Vegas. We shared samples with key media partners and bloggers and quickly heard back from them with the first set of Joya Red reviews. 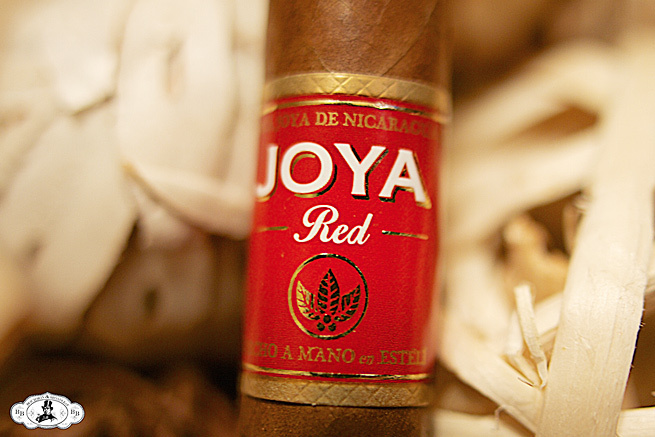 The experts and aficionados have kept the conversation around Joya Red going. Here are the 10 latest Joya Red reviews in no particular order. “The JOYA Red by Joya de Nicaragua is a flat-out fantastic cigar. With the price of $6 a stick and around $109 a box for the Toros, the JOYA Red is literally a steal. Seriously, this is a $15 cigar that is marked for $6. Just amazing. Wow. Find it, buy it, love it.” Read the full review here. “First light reveals a great draw with medium bodied flavors of a smooth slightly sweet creamy tobacco and long oily finish. The first third brings the body down to mild-medium, keeping the same profile just extending the natural sweetness through the finish. Burn is fast but very good.” Click here to watch the video. “This is a full-flavored, medium-bodied cigar that I could see myself smoking (and enjoying) at any time of day. Definitely one to keep in the humidor.” Read the full review here. “…I found the milder strength and milder body worked extremely well with this blend. The tobaccos almost seem to come together in a perfect storm. Add some great construction and balance, and this cigar has all of the makings of a winner.” Read the full review here. “This is a really nice medium cigar right now for me. It’s super smooth… Nothing overpowering but very pleasant notes… I’m going to give this one a rating of a 91, which is a very good rating. It’s a great medium bodied cigar.” Watch the complete review here. “Red is a very good smoke, showcasing some properties of Nicaraguan tobacco that you might not normally experience. This cigar is a powerhouse of flavor instead of body and nicotine.” Read the full review here. Lauded as a value offering, the Red absolutely blew me away. I am sold on this new line from one of the biggest boutique names around. I mean, for the price it is a hard cigar to pass up. Rating: 92/100.” Read the full review here. “I have smoked five of these cigars so far and what I can tell you is the Joya Red is perfectly constructed… Should you buy it? Definitely. The flavor profile that this cigar is made up of is excellent, the tastes and aromas really make this cigar stand apart from others.” Read the full review here. “The new marketing slogan for the JOYA Red line is “REDiscover JOYA!” And that’s exactly what I think you should do. The JOYA Red is a nice change of pace from the guys at JDN and what I would consider an everyday smoke with an everyday price!” Read the full review here. “The cigar burned perfectly, and was another nice, sweet medium bodied smoke. It has the terrific flavor of the Antaño lines, with a fraction of the strength. This is a great smoke for any time of day.” Read the full review here.